Also serves Arroyo Grande, Oceano, and Pismo Beach. We offer safe, secure and convenient storage for individuals and businesses. Standard storage unit sizes range from 5x6 to 12x30. Vehicle storage is also available for automobiles, boats and RVs up to 30 feet in length. Our storage unit prices are competitive. 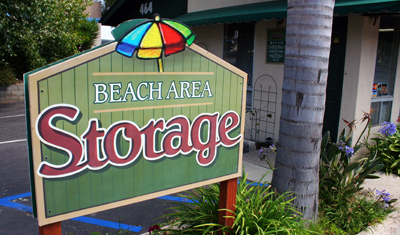 Located in Grover Beach between San Luis Obispo and Santa Maria, Beach Area Storage is easily accessible from Highway 101 and Highway 1. There are no long-term requirements. All rental agreements are based on a month-to-month occupancy. Move-ins are prorated to the 1st of the month. All new rentals include a free lock. Our friendly staff is available to answer your storage questions. If we can be of any help, please call us at (805) 489-9272, or drop us a note using the form on the contact information page, and we'll respond promptly. *Daylight Saving Time hours. Non-Daylight Saving Time hours are 7:00am to 6:00pm. **The office is closed for lunch Monday – Saturday from 12:00pm – 1:00pm and Sunday from 1:30pm – 2:00pm.